How does the new tip of the spear shape up? Which Cars Could Possibly Compare with the Aston Martin DBS Superleggera? There once was a time not too long ago when station wagons were becoming irrelevant. They still had a following, but fans of wagon we’re dwindling. Fast forward to the present, and the script has flipped entirely. Wagons are popular again, and a big part of that is the design reinvention they’ve enjoyed in recent years. Need two examples? 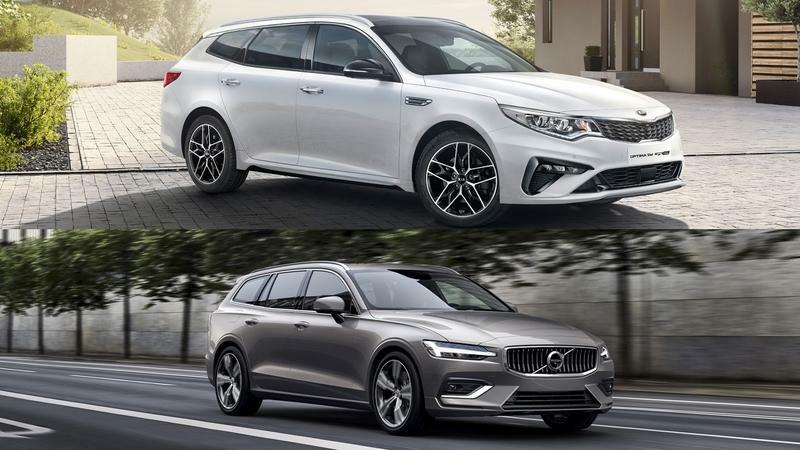 Look no further than the Kia Optima Sportwagon and the Volvo V60. The Ford F-150 Raptor has been the high-speed off-road champ since its introduction in 2010. That all might change should Ram green-light the TRX Concept it debuted at the 2016 Texas State Fair. This beast is Hellcat-powered, boasts 37-inch tires, and a suspension system that rivals the Raptor’s underpinnings. Both trucks have upgraded engines above their average counterparts. 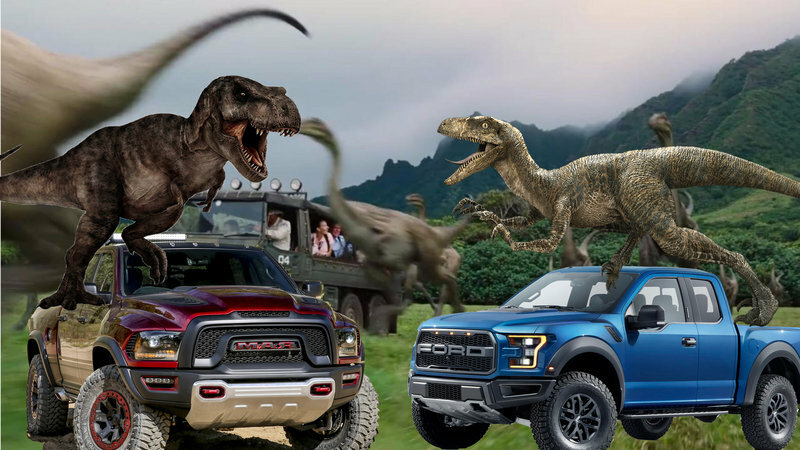 The Raptor boasts a high-output version of the 3.5-liter EcoBoost, while the Ram 1500 Rebel TRX Concept sports a detuned version of the famed Hellcat V-8. Don’t let the “detuned” term fool you – this engine still makes 575 horsepower. Both trucks also wear unique bodywork that differs from their mundane counterparts. Unique front fascias, hoods and bumpers are found on both trucks, as well as wider fenders that cover each trucks’ expanded track. Both also feature knobby tires mounted on beadlock wheels (an option of the Raptor). Nevertheless, there’s still plenty that separate these two prehistoric beasts. Let’s have a look. The Ram pickup has long been a major player in the full-size pickup segment, though it usually trails the Chevrolet Silverado and Ford F-150 in overall sales. Nevertheless, the Ram continues to push innovation, design, and interior development within the segment. Likewise, the F-150 has been highly competitive with those criteria, introducing its all-aluminum body, EcoBoost line of engines, and a large number of useful technologies. Ram’s laundry list of innovations includes the 3.0-liter EcoDiesel V-6, the eight-speed automatic transmission, and its multi-link coil spring rear suspension. Both trucks have far more to boast about, but these are the ones most often seen in advertisements. Of course, brand loyalty plays a huge role in pickup sales. 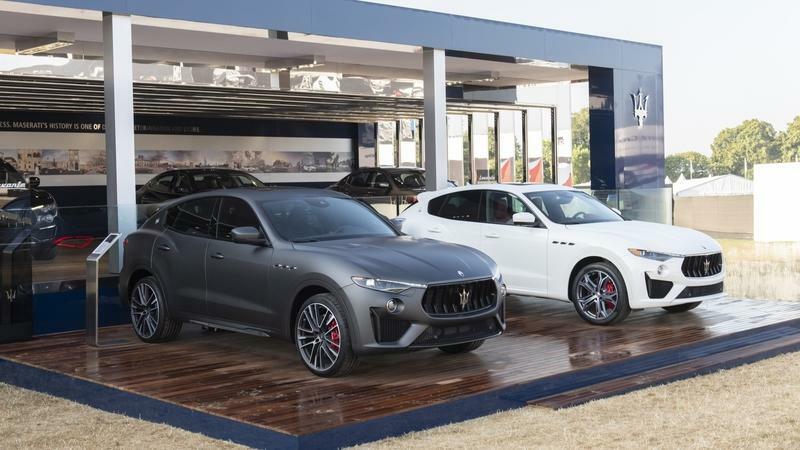 Customers fiercely defend their purchase decisions, backed by automaker’s quibbles over tow ratings, fuel economy, and “other mines-better-than-yours” talking points. However, there are plenty of customers who don’t have an established brand loyalty. 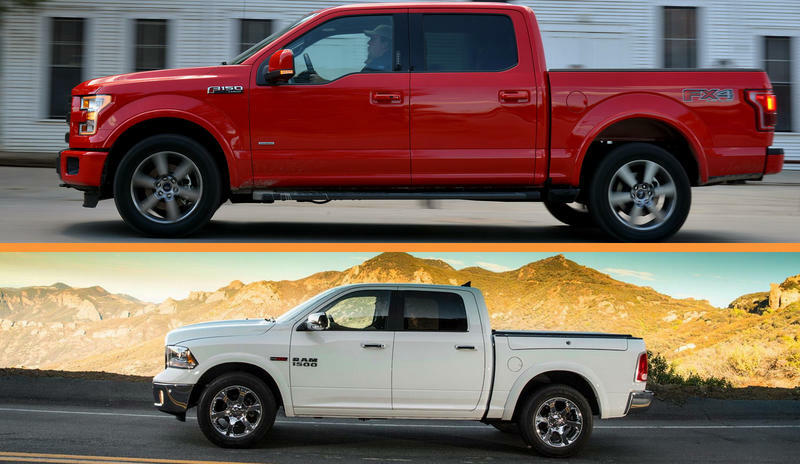 That’s who we’re targeting here – the undecided buyer wanting to know all the options between the Ram and F-150. Let us know what you think of the two trucks in the comments below. You can also check out our comparison between the F-150 and the 2016 Chevrolet Silverado 1500 here. 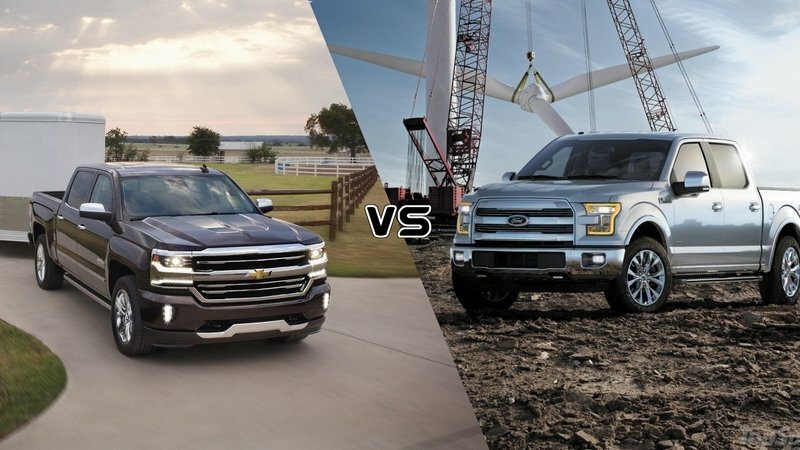 Chevrolet and Ford have long been archrivals in the full-size pickup segment, with the Silverado and F-150 battling it out for bragging rights and sales. For the past 39 years, Ford has clinched the sales title, but the Chevy’s pickup has always been close behind. In the bragging rights department, titles of towing and hauling capabilities have moved back and forth with advancements in vehicle design. The 2016 model year has proved to be a fairly stable year for both the Silverado and F-150, with neither undergoing major updates or changes. That gives us a good chance at comparing the two head to head. For the sake of thoroughness, we’ll include all the possible variations of trucks, including cab and bed configurations, powertrain options, and trim levels. While a large majority of pickup purchases follow strong brand loyalty, there are plenty of customers new to the pickup segment. These are the folks who don’t have the hardened brand faithfulness and are more likely to objectively shop the entire pickup segment. That’s who we’re targeting here – the undecided buyer wanting to know all the options between the two. Let us know what you think of the two trucks in the comments below. Which truck would you buy and why? It’s been about three years since BMW discontinued the 1 Series M Coupe, the performance car that many described as the most exciting product the brand launched since the original E30 M3, and Munich has finally rolled out a successor to the compact coupe. It’s called the M2 and it generated a lot of hype among BMW purists. There are plenty of reasons to get excited over the M2. It’s not only lighter and more affordable than the M4, it’s also more compact, which should make it that much more fun to drive at the track. In essence, it’s everything the 1M Coupe was and then some. In short, it’s a modern-day incarnation of the original E30 M3 – the vehicle regarded as the best road-going M car BMW ever produced. But how does the M2 measure up against its three-year-old predecessor? 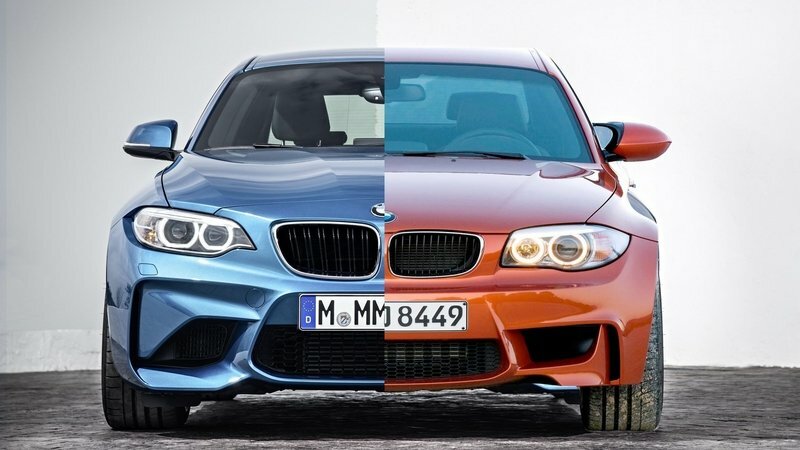 Does it have what it takes to make us forget about the 1M Coupe? At first glance, the M2 is both quicker and more powerful, but there’s more to a sports car than just horsepower figures and lap times. The 1M Coupe is already an icon to BMW enthusiasts and because Munich built very few of them. Well-maintained examples are as expensive as a 2016 model year performance Bimmer. The M2 has a big pair of shoes to fill, not to mention the fact that BMW went as far as to promote it as a spiritual successor to the E30 M3 and the 2002 Turbo. Now that’s a bold statement. With the M4 having received a lot of heat for being too big and heavy, the M2 needs to step up and take over from where the 1M Coupe left as the lightest and most nimble modern-day M car. That’s lot of pressure for both BMW and the M2. Sure, a real-world test will settle this debate, but that’s unlikely to occur until 2016, when the M2 is scheduled to hit showrooms. However, with the new coupe out in the open now, it’s time to have a closer look at both the M2 and 1M to find out which one looks better on paper. Every fall, dozens of journalists from all over Texas and around the country gather to compare, test, and crown the winner of the “Truck of Texas” competition. It’s a coveted award from the Texas Auto Writers Association that signifies Texas’ collective approval of a truck. And not only are trucks involved, awards go out for the SUV and CUV of Texas. This year’s competition was fierce. There were 84 vehicles present from 21 automakers entered into 17 different categories. Evaluating the field were 69 TAWA members comprised of journalists and social media influencers. So let’s get down to the results. Keep reading for the full breakdown. 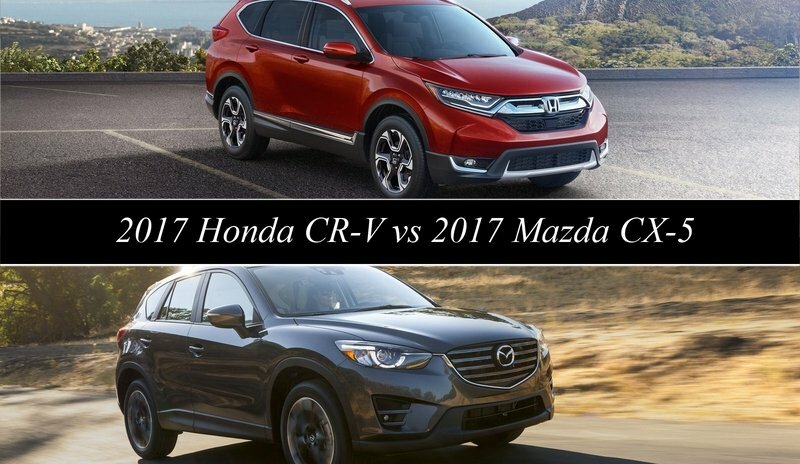 Traditional body-on-frame SUVs are becoming something of a rare breed these days with unibody crossovers picking up the sales slack. Folks seem to be more worried about fuel economy than towing numbers or off-road abilities. Still, the market for the old-school, ladder-frame SUV exists and models are still moving off dealer lots. 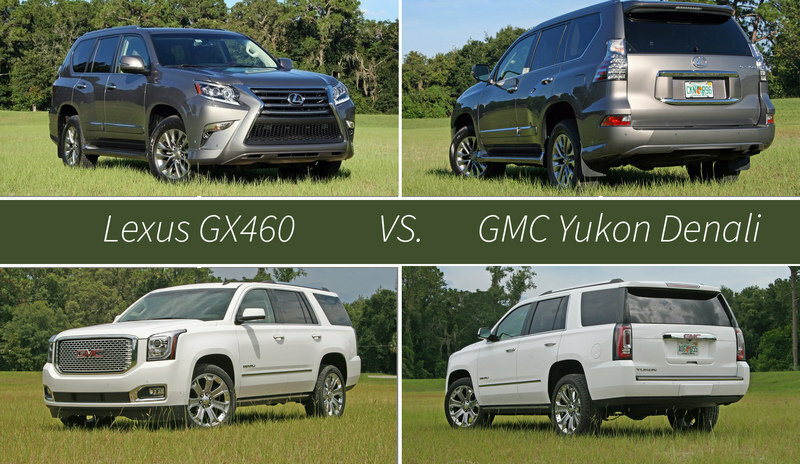 Two of the more luxurious examples are the Lexus GX460 and the GMC Yukon Denali. 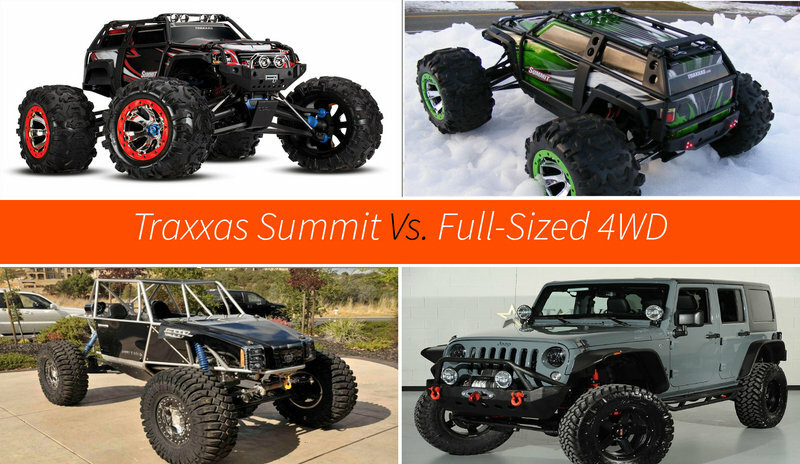 Both of these beasts come packing some serious hardware, including V-8 engines, standard/available 4WD and trailer hitch, roof racks, tall ground clearance, and enough attitude to make a snotty high school girl seem angelic. But how do these two compare when pitted against each other? 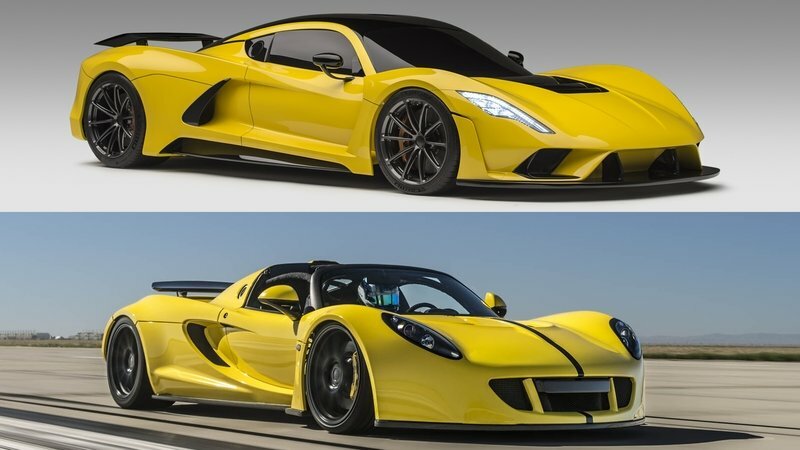 Both go for the luxury segment, both are slathered in chrome, both offer three rows of seating, and both cost over $60,000. That’s what we’ll find out. To preface this comparison, both the GMC and Lexus have spent a week in my driveway and were driven on the same roads, in the same conditions, and even photographed in the same place – all within a two-month window. So let’s get to it. Let’s face it — it’s not easy being an off-road RC truck kind of person. Off-roader RC vehicles don’t have the crowd-drawing awe factor of RC airplanes, which at 500 feet of altitude at least look plausibly full-scale. Dirt buggies don’t have the poncy F1 appeal of road racers, those studies in design sophistication and engineering. Off-road trucks are just bashers — pure, pointless, unadulterated fun sure to draw the ire of those too boring to see the value in juvenile hooliganism. The Jeep Wrangler has long been the king of off-roading machines. It’s two solid axles, manual transfer case, gracious ground clearance and never-ending supply of aftermarket parts have made the Wrangler the stuff of legend. What’s more, its removable doors and top put passengers closer to the elements and heightens the thrill of the trail. Of course, for all good champions, a new challenger is never far behind. Enter the 2015 Toyota 4Runner TRD Pro. This is Toyota’s latest version of its (almost unchanged) 4Runner design. Thanks to some clever engineering in the Toyota Racing Development labs, the 4Runner now enjoys a truly hard-core off-road version that usurps even the venerable Trail Edition 4Runner. Heavy duty Bilstein shocks with remote reservoirs, thick coil springs with a 1.5-inch suspension lift, upgraded wheels and tires, and a tank-like front skid plate make the TRD Pro a natural in the dirt. 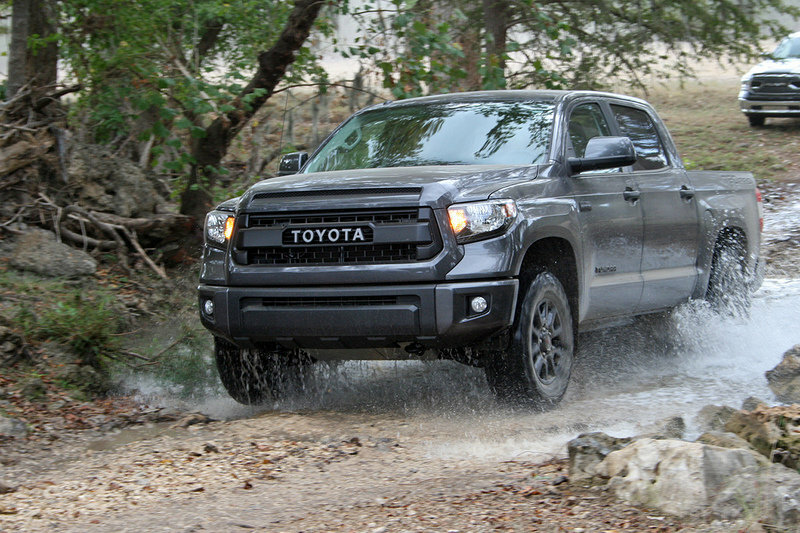 All the same off-road tech on the Trail Edition carries over to the TRD Pro as well. This includes the electronic locking rear differential, manual transfer case, and Toyota’s Multi-Terrain Select system. Differentiating the TRD Pro series 4Runner from the standard models is a unique front grille with TOYOTA spelled out in block letters. Appropriate TRD Pro badging follows suit, attached on the C-pillars and bespoke TRD Pro wheels. Things inside aren’t much different than other 2015 4Runners, beside a TRD gear shifter and some branded floor mats. 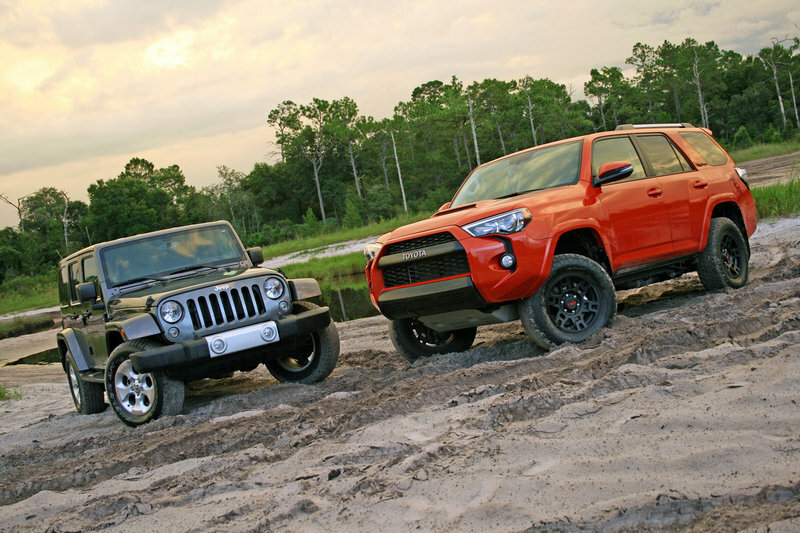 So how does the 4Runner stack up against the stalwart Jeep Wrangler? Head on past the jump for the full rundown and videos.